So, tell us a bit about your fishing background.. I have been fishing since the age of Five (27 years). My older brother was heavily into his angling. Eventually I took to trying and ultimately loving it too. I used to go with him and watch, but eventually I saw enough and wanted to show him how it was done! (and I did). I began fishing the local ponds and lakes close to my home in Nottingham – Getting up early and pedalling on my BMX to venues – enthusiastic and eager, those were the days! I found solitude in river fishing, something that I took immense satisfaction from. There’s something about the wild nature of rivers and that very fact of not knowing what fish will bite next which is ultimately appealing to me. From then onwards, I was seldom away from the river banks especially during the six week holiday’s off school. The river Trent became my love and passion, where my youthful dreams were pondered and where I still try and make them a reality to this day – I’m still waiting on the 80lb shark!!! I guess now aspirations are more realistic but I still have those dreams and targets. In my late teens I began researching barbel predominately on the river Wensum (my parents owned a static caravan on the banks of the river) and later on the river Trent. Nothing serious of course, just a lad, a pen and a piece of paper. I began to jot down what I saw and how barbel interacted with commercial/non commercial type baits and methods that I had put to them. It wasn’t about catching fish, but more about watching and learning their behaviour – trying to understand why barbel do what they do and react in the way that they do – for my own research. This, to me was exciting and something I enjoyed doing more than fishing I guess at that time. I got back into fishing in my Twenties but after moving to Scotland 10 or so years ago bank time is somewhat limited, but I do make the most of it when I get back to Nottingham for a week or two at a time every few months. My current blog is in a state of transition at this present time, the blog mechanics do not allow me the maneuverability to be able to include my articles, pictures, features and now my new venture in baits properly. I guess because it’s free its a price you have to pay unfortunately… literally! A new website is currently being constructed and should be ready for sometime in March – it’s something I am very looking forward to as it will include a shopping section for my 3 F T products and give my ‘field testers’ the chance to write their own blogs and articles, thus submitting their fishing techniques and methods and not just my own – variety is good! The website will also include features that I am proposing to do on many of my baits to the basic tasks needed within angling such as tying a knot and using a feeder or leger tactics correctly. I hope they’ll be something for everyone on the site and bring a fresh and vibrant look to what I am doing now. Lastly, amongst many other things that I’ll not drone on about is a ‘video’ section, this will be where I’ll do certain features and show certain things regarding methods in stream form. What are your favourite places and methods of barbel fishing? Easy for me. It has got to be the Trent, I have fished many rivers, certainly not as much as I’d like but this last couple of years since establishing new friends in angling it has took me to a few different rivers around the country. I don’t think, for natural beauty and surroundings and plenty of barbel you can beat the river Wye to be honest – it’s a stunning river! But for big barbel, for me the Trent has it in abundance, it may not have the stunning views and picturesque backdrops but a double figure barbel setting off like a steam train certainly makes up for it. I am a big fan of the feeder approach and the diverse ways that you can fish it. Most people have this impression that you fill the feeder and cast it out a few times on the same spot and that’s it! Because of its diversity it is certainly one way to fish the method, simplistic as the feeder is the approach lends itself too far much more than this. I attach a piece of foam, not only do I fill the feeder up in summer (generally when I use them) I will also immerse the foam attached to the lead on the outside of the feeder in some soluble salmon liquids or similar, creating a nice scent trail for yards downstream. I am a firm believer that flavours are there more to catch the angler’s than the fish but soluble liquids and additives certainly do work and serve a purpose in all manner of ways, from bait making to fishing this technique/method on a feeder. I attach the foam by using some water resistant glue like araldite to stick it firmly. The foam is not large, but just enough to carry some liquid. This I believe can give you a very good edge in the summer months when the water is warm and the fish and generally a lot more willing to feed. This is just one more way to enjoy feeder fishing, many other ways will be discussed later in future blogs, features or articles. I also enjoy float fishing for barbel – not something I have had a great deal of time doing if I’m honest but something I am wanting to do more of in the coming seasons. I love fishing the Cralusso floats that give you stability in the harshest of flows and currents – they’re simply outstanding floats. Using a long rod ‘bolo’ style and these superb floats you have so much control on them that you can simply hold them out in the flow at 30 yds out into the river and keep them there still, you can almost write your name with them and come back to dot the I’s. They are expensive floats but well worth it – should last a lifetime! I hope to do something on these at the end of this season so I’ll not say too much about them. What prompted you to start manufacturing your own baits? I think the reality of my situation (living in Scotland and not having the barbel rivers to fish) prompted me to find a niche if you like, to enjoy something with regards to angling but not feel under any pressure to do anymore than I could. After a brief spell with Pallatrax who if I am honest were very good with me I decided that fishing and what it entailed me to do in order to be successful was something I had neither the time or money to finance – coming back and forth to Nottingham was taking its toll on finances and my work. It wasn’t possible to keep the level of commitment up financially, that’s not to mention the effect it had on family life. I decided that after all my years of research and all these notepads getting dusty on the top of my wardrobe I would do something with them, putting what I had learnt all those years ago to good use and try my hand at bait making. One problem though, I couldn’t or didn’t have the first clue about how to roll a boilie, I just knew what I was trying to create (I guess like a workman without his tools). I got in contact with a certain Anthony Wood who derived a recipe for my first boilie, all I had to do was buy and make them from the ingredients he proposed. I watched lots of youtube videos on how to make boilies and how to roll them, then I began doing it, with Ant’s support I got there in the end after a few trials and tribulations. I have now modified the first created boilie named the ‘Rubby Dubby’ and although it still contains a lot of additives and powders from the original recipe I have tweaked it to a point where I feel happy with it. I am now making recipes myself after doing lots of research and reading lots of ebooks regarding it. I feel confident enough with what I already know from my research into barbel what will work and what will not! Who would you see as the main target market for your baits? I am aiming my baits at angler’s who believe in what I’m doing and want to give them a proper go as without these people how is it possible to be successful in any walk of life? It’s not just a fishing or the angling community thing, it could be when you walk into an office for your first interview, it could be that your a great singer and you want to be noticed and signed up to a label, anything really, you need a break to be successful at anything! It would be easy for me to sit here and give you some fancy slogans to what my baits do that are different to anyone else, but nowadays as I see it there’s companies who all do things differently, but quite often no better than any of the rest. It is simply the people that believe in their products that makes a ‘Mainline’ or a ‘Dynamite’ range deadly on many waters, not the people who make them. Fish respond to different food sources over a period of time, sometimes this can be half the battle with new products that you endorse and market to your audience. You claim they catch fish but how long will they use them before they get fed up and head for their nearest tackle shop in search of the wonder bait? Simply put, if you create a good balanced bait it can be more about how often the fish are used to seeing and feeding on it that dictates catches, not the bait itself. The top brands are used everywhere and fish are caught from anywhere on them, being careful however that their next product is not too dissimilar from the previous and successful one. This is why it’s so important to have people with you, supporting and essentially believing in your products, without that then you haven’t got the next ‘Mainline’ or ‘Dynamite’ – you need good people doing all they can for you to make the company successful, with that the catch reports follow. I’ve had some success using your boilies, what other results have people had? I know there’s a couple of people on the team that think I have a secret man crush on Dale Thomas – I can categorically say, and on record it’s hard not to love the man. Dale has produced some stunning river Wye barbel this season hooking 3 doubles in 4 sessions I think it was. Having his best season for barbel on the Wye to date having a total of 4 doubles all on the ‘Rubby Dubby’ boilie (amongst many, many other barbel & chub), he’s known as the ‘Dubby King’ – in fact his new hoodie for 3 FT simply states his name as ‘Dubby Dale’. I think that will stick – don’t you? 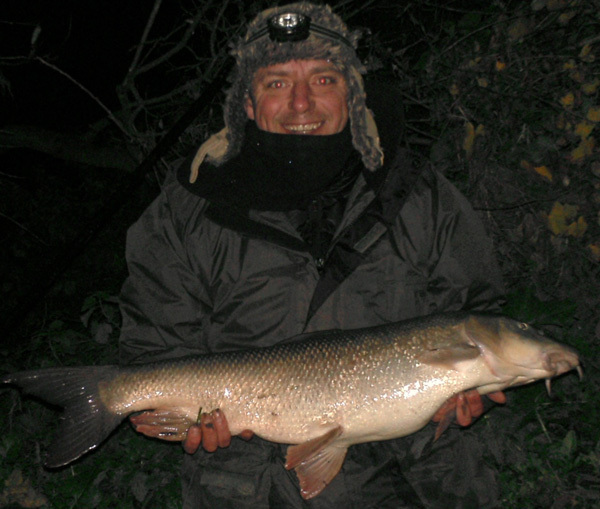 Dave Varnam produced a stunning 13lbs 4oz barbel on the Soar which wasn’t far off the record. Adrian Needham produced a fantastic 14lbs 6oz barbel on the Trent which currently holds the record for the biggest fish caught on the ‘Dubby’ from a tester. 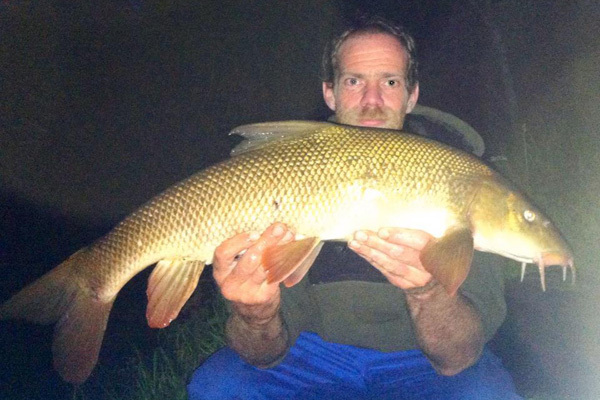 Stuart Woods has also done very well with fish to 13lbs 13oz on his local river. Gary Lucas has produced some cracking doubles also to over 11lbs on the Thames. Hope I haven’t forgot anyone, there’s been numerous doubles – I couldn’t possibly list them all. You must be pleased with how it’s coming along, what are you working on at the moment? Yes I came into this with my eyes wide open, nothing is guaranteed in life of course, you have to work hard at anything to reap the rewards. The hard work I have put into the company is paying off with angler’s wanting to test for 3 F T and European Consultants such as Frans Vogels and UK based Consultant Dale Thomas (sorry there’s that name again) things are moving forward quicker than I would have imagined. I started with a 5 year projection of how things would grow in that time, suffice to say I am ahead of that projection. I certainly didn’t expect this much interest within its first year. Having the likes of Frans on board gives us that opportunity to make a name for ourselves in Holland, Belgium, Italy and Germany where Frans does a variety of talks, guiding and articles in angling publications. I am working on lots of things currently. Groundbaits being the main focus and of course more boilie recipes for this coming season. I am very excited about the new groundbaits that I think will give lots of variety and matching these to my hookbaits is very much at the forefront of my mind. I also working on a new product named ‘Ringo’s’ that are a soluble pellet type shape feed bait, that are used in a daisy chain type scenario with the ability to thread them though the hooklength and coming to rest on the hook point, these will break down quickly and leave a nice carpet of feed right next to your hook bait whilst also disguising your hooklength from the fish. This is predominately made for carp in mind on a lake or pond, but it’s something I aim to trial on the rivers. I am very excited about the future, many things in the pipeline that I am looking forward to doing and getting out to the testers. 2013 is looking like it will be a great year for 3 F T and the future looks very bright indeed! A good read, most humbling I was simply happy to report back on what I caught. Thanks Ant – I really appreciate all your assistance and still do in making what I have now, a growing and exciting bait company. Richard I have long been an admirer of your quest to discover the Barbel Menu of baits, your continous success in the art of catching Barbel never ceases to surprise me. What’s on the agenda for Foot Twitch now I hear your thinking of returning to Scotland to your family. Also will the Foot Twitch bait still be available as it has been, as I feel the best of your baits are yet to come…..
very good read Richard, after a long time without being able to fish due to military service is it great to learn from people who know about barbel! 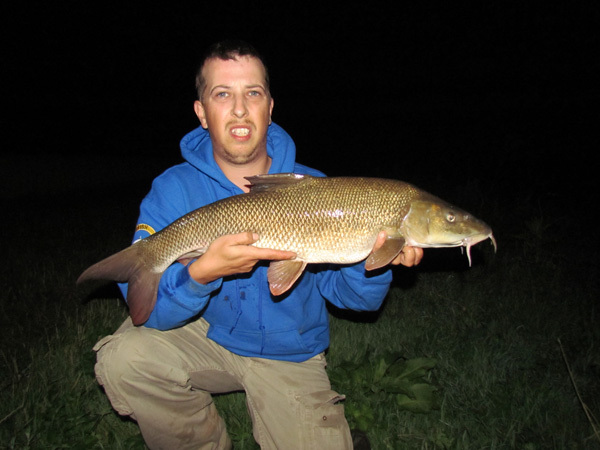 Since restarting in 2013 I have reserched so much about barbel! Predominantly Warwickshire Avon my local river and where my pb arrived in 2013 a 15.4lb known as Kodak for his distinctive features, I will continue to learn and look forward to trying your fantastic baits!